Meet The Team - FutureQuest, Inc.
FutureQuest began as a dream between a systems engineer, and a web designer. The name was registered in January of 1998, and the business came to life in June of that same year. Two people, one server, and six T-1s, planted the seeds for the community we have today. The goal was to create an environment where web site owners would enjoy the power of having real-time interactions with the providing host, as well as the virtual neighbors they shared the network with. 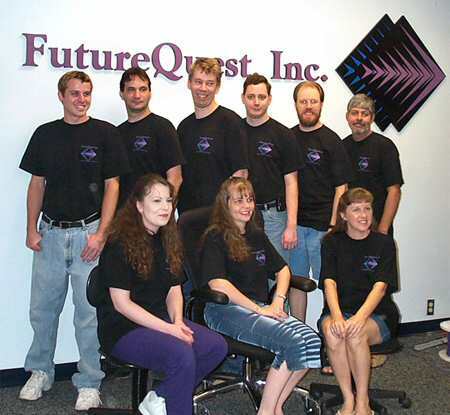 Prior to FutureQuest, many felt a void that seemingly blocked them from their neighbors and left them feeling alone with the task of developing their web sites. FutureQuest has been instrumental in removing that void, and we continue to pave the way toward new standards in the hosting industry. With an honest service and public message forums as the foundation, FutureQuest has built positive relationships with the site owners, in addition to providing a way for the site owners to give and receive valued input regarding the development hurdles they may encounter, as well as the servers they share. A simple concept, that has resulted in higher standards throughout the industry, as well as empowering the site owner overall. If you have not yet visited the Community Forums, please click here to do so now. The FutureQuest team members most available within the online community. Being on a FutureQuest is not something to be described. It's something to be experienced! Copyright © 1998-2019 FutureQuest, Inc. All rights reserved.